Dreaming of your next vacation destination? Wanting something that’s a bit exotic and unexpected? If you’re looking for outdoor activities, inspiring natural beauty, thrilling new adventures, a fascinating history with global impact, and a culinary scene that exploits the impressive range of local ingredients, all while being affordable — head to the Azores, the lesser-known autonomous region of Portugal. Located in the middle of the Atlantic Ocean, the Azores is just a four hour direct flight from Boston or New York. With a year-round temperate climate and breathtaking scenery, the Azores should be high on your list of island vacation destinations. Comprised of nine islands, this volcanic archipelago is truly a hidden gem. Here are four tips for getting the most out of spending a week in what is being called one the most beautiful places in the world. 1. The Azores is divided into three regions and there are 3,370 miles between the most northerly island, Corvo, and the most southern island, Santa Maria. 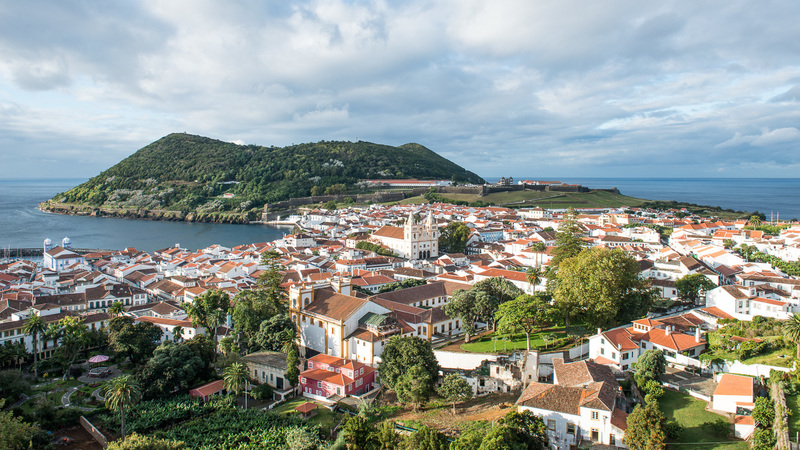 By focusing on the Central Group, which includes Terceira, Graciosa, São Jorge, Flores, Pico and Faial, and adding São Miguel of the Eastern Group, you’ll experience the diversity and beauty of these islands, which are easily accessible by ferry or short plane ride. 2. While all of the islands offer outstanding outdoor activities (hiking, swimming, snorkeling and diving, horseback riding, fishing, biking, boating and sailing, and sunbathing by a natural or man-made pool, if you so desire), each island has a distinct personality. Terceira – (Cosmopolitan) Angra do Heroísmo is home to nearly half the population of Terceira (with about 30,000 residents), but its size is much larger due to international trade, the strategic military base, many convents and churches, museums, and local and international festivals that draw crowds from around the world. Faial – (Family-oriented) Faial provides diverse sightseeing opportunities including the whaling and scrimshaw museums, the Capelinhos Volcano Interpretation Center at the 1958 eruption site, and The Vale dos Flamengo (Flemish Valley) that will remind you of Bavaria with its lush hillside farmland. Faial has a long history with sailing and sailors and in the summertime it comes alive with yachts that harbor in the town from points around the world. Pico – (Adventure) Pico is also home to the highest point in Portugal, Mount Pico, which affords many outdoor adventures. It’s also home to some of the most unusual vineyards found anywhere in the world with room sized “cribs” made of volcanic rock protecting the vines from the wind and ocean spray. Sao Miguel – (Luxurious) This is the largest island and contains some of the most stunning long-range views overlooking the ocean, parts of the island, and the city of Ponta Delgada. There are botanical gardens, hot springs, mineral pools, and extraordinary natural beauty. Here, you’ll find five star accommodations, luxury resorts, and restaurants offering fine dining. 3. The time of year you choose to travel will provide a very different experience. Summer is peak season, but it’s also the hottest and most humid time on the islands. Late spring is the best season for the magnificent indigenous and imported flowers that have found their happy place on these islands, while fall provides a beautiful transition season with fewer tourists. The winter months are still mild and the island is even more affordable in the off-season, but may be too cold for water activities. 4. If you visit in the spring or fall, be aware of the changing weather that will impact your outdoor activities. Trips to the top of the mountains to view the scenery should be planned for afternoons as the mornings can be quite foggy. VisitAzores.com provides detailed information about each island as well as things to do, weather conditions, and even live cameras to give you current information on conditions at some of the most visited sites on the islands. Also, download their apps to your smartphone for mobile information and guides during your visit.